Another phone profile offered under Sun Plan 350, this time it’s MyPhone A848G smartphone that runs on up to date Android OS Jelly bean. 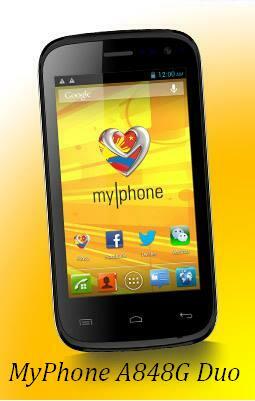 Sun Cellular never stop giving us more options on their postpaid plan, from MyPad tablet, MyPhone A818 Duo, MyPhone A919 Duo Plan and this one which now fall on another affordable plan price for only P350 monthly charge. Bundled on that plan is the added one network profile that you can choose that fits your needs, either your more on all networks text or only within tri-net. MyPhone A848G is one of the newly announced smartphone with 4 inches capacitive touch screen display now available exclusively on Sun Plan. A848G Duo sports a 1 GHz dual core processor and Jellybean version 4.1 offers smooth UI experience. It has also a dual camera feature with 5 megapixels on the rear side and VGA on front for you to use in capturing portrait images. Aside from that, this phone also features 3G/ Wi-Fi and Bluetooth connectivity, Dual SIM functions, TV out capability, 4GB internal storage and Pinoy App. To avail this plan all you have to do is submit the requirements needed to your nearest Sun Shop or you can also apply online.